STAFFORD – Josh Wood’s Sunday at Stafford Motor Speedway started with the disappointment of mechanical issues in his SK Modified in the division’s 40-lap feature. But it took just a few minutes after the SK Modified feature for Josh Wood to get his redemption for the day. 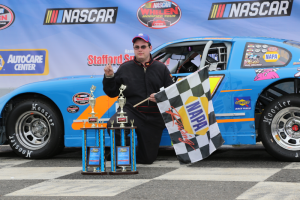 Wood led every lap on the way to victory in the 30-lap Late Model feature at Sunday’s NAPA Spring Sizzler at Stafford Motor Speedway. Michael Wray of Northford was second and Glen Reen third. Steve hit a nerve. Lousy car count, three laps of competition then spread em out and bore you until the checkered flag. Last year I was at races where cars were 6 car lengths back and Dodge and Buckler were trying to make it sound like it was door to door like people don’t believe what they see.Late Model Lights and Dare’s as well. Meanwhile the car count for SK Lights went up to 27 for the Sizzler and the competition is great.The SK’s are killing it and the SK Lights are super strong. They deserve to be the second division. Add a Street Stock truck division that utilizes old Rangers, S10’s and Dakota’s, make it as cheap as safety will allow and there’s your future. Car counts low? 16 cars took the green, I know of at least 4 more teams putting cars together for the 2017 season. An 18-20 car field is healthy. Why would Stafford dump a division and leave 20 teams out to dry. And to Doug’s point, WTH would anyone create another division!? Weekly racing is finally stabilizing in this stafford, let it be! Obviously the first two posters were not at the track this weekend. LM Driver is on board and ha some actual facts to add to the conversation, thank you. Keep the same divisions and rules, it saves money! Never listen to captain keyboard and grandstand gadfly Doug with his silly commentary to bring in trucks and change everything that is finally working. When Doug, or any other civilian for that matter, starts making the decisions on rules and the division line ups that is a sure way to disaster. As for as “cheap as safety will allow” comment there in absolutely no logic there. I would like to hear Doug’s estimate as to what that cost would be to build a truck to run Stafford that is safe. I know what it is because I own a lot of cars and pay the bills. Let me tell you it is a lot more than you think. Least expensive is keep the rules the same. Car counts. On September 16, 2016 12 cars took the green in the Late Model feature. September 2, 2016 14 cars in a special VMRS show. August 5, 2016 14 cars. And the racing is boring. Really boring. Tracks change divisions all the time. The SK lights are exciting and on the rise.They are a natural extension and conduit with the SK’s for equipment and drivers. People love the competitive racing green to checker. No one is saying change anything this season. This is about the future and ideas. The Stafford management knows what it wants. Maybe the goal is to fill time until the SK feature and a field with 12 cars just meana smaller purse pay outs. i don’t know. I just know Late Models are dying at Stafford with most of the movement upward to modifieds and not Late models. I come up from Long Island a few times a year.I love the late models on the big tracks.They also are a classic short track division.They seem pretty popular to me.I hope they will stay a part of the show at NASCAR tracks.And I agree racers and track management should be calling the shots on rules. Glad you took the time to look up those numbers. More cars were there Sunday then last year. To me that is growing, not dying as far as i can tell. Maybe I’m wrong, math isn’t my strong suit. I would like to see Stafford combine the limited lates and late model races anytime they have less than 30-32 cars total for the two divisions. You can tell the difference between the two divisions by that silly wing on the limiteds. I believe they have a rule saying a driver can not run the two divisions on the same night. I have never seen a driver run both divisions in the same night. keep separate victories, payouts and points just run them together to save time. Give the combined group the Late Model race laps a small purse bump for the limiteds for the extra laps. I just have not seen many compelling races in both divisions lately. Perhaps more cars would make it interesting and I would be rooting for a limited to win overall, give them a bonus if a limited could take overall. How far apart are their lap times? I don’t think it is too significant that it would be dangerous. I know the LM drivers would probably be against the decision but from a paying fans perspective I believe it would help the show significantly. Stafford is going in the right direction, Sk’s are great, lights are a great feeder division and they dropped the legends on the go kart track which drew a handful of cars. I was kind of surprised they didn’t pick up a few extra waterford sk’s. Stuart Fearn. Fearn? That name rings a bell. Would that be the Stuart Fearn, part of the first family of full fendered racing. Brother of legendary Tom Fearn and father of Alexandra one of my favorites indeed. First a piece of advice. Calling paying fans civilians, ” captain keyboard and grandstand gadfly” are not facts.those are opinions. Opinions that many might say suggest that Stuart Fearn thinks that racing exists for the personal enjoyment of the Fearn family. A family that I for one am happy is involved in the sport but part of the sport, not the focus of it. Pointing out that one team won half the races last year in Late Models by the name of Fearn is a fact.Pointing out that on June 3rd, 8 cars took the green in Late Models and on June 17, 10 cars.Pointing out that 11 limited late models took the green in the 2017 Sizzler while 27 SK lights took the green. Those are facts. Saying the racing is boring is my opinion. As an old Street Stocker that built 5 cars I have an idea, albeit outdated, on the difficulty and expense of building and campaigning a car. Suggesting that I don’t know the cost of building a new one is mostly correct. Suggesting that a cheaper entry point to racing should never be mentioned by a “civilian” cause Stuart Fearn, part of the first family of fenders has all the answers comes off a bit arrogant don’t you think? I would simply remind you that we “civilians” in the stands actually have a roll in supporting the sport aside from cheering you when you win. And that is all I Captain Keyboard, have to say.